Cocaine and other drugs of abuse hijack the natural reward circuits in the brain. In part, that's why it's so hard to quit using these substances. Moreover, relapse rates hover between 40 and 60 percent, similar to rates for other chronic conditions like hypertension and Type 1 diabetes. University of Pennsylvania behavioral pharmacologist and neuroscientist Heath Schmidt studies how long-term exposure to drugs such as cocaine, nicotine, and prescription opioids affects the brain and how these changes promote relapse in someone who has kicked the habit. A recent paper, published in the Nature journal Neuropsychopharmacology, investigated a novel treatment for cocaine addiction, something that touches 900,000 people in the United States annually. "As a basic scientist I'm interested in how the brain functions during periods of abstinence from cocaine and other drugs and how neuro-adaptations in the brain promote relapse back to chronic drug taking," he explains. "From the clinicians' perspective, they're looking for medications to try to prevent relapse. Our goal as basic scientists is to use animal models of relapse to identify novel medications to treat cocaine addiction." Schmidt and colleagues from Penn Nursing and Penn Medicine had hypothesized that the neural mechanisms and neural circuits in the brain that play a role in food-seeking might overlap with those key to drug-taking. Through several experiments, they discovered that drugs that activate receptors for glucagon-like peptide 1 (GLP-1), a hormone that reduces food intake and blood glucose levels, could actually decrease the desire to seek out cocaine. What's more, there are several FDA-approved medications used to treat diabetes and obesity that already target GLP-1 receptors. "One of the first questions we had—and we were really just kind of curious—was, does cocaine at all affect circulating levels of metabolic factors like leptin, insulin, GLP-1 that have been shown to regulate food intake?" says Schmidt, whose primary appointment is in Penn's School of Nursing. The research team got its answer from a simple experiment with a rat animal model: Blood drawn after 21 days of cocaine intake revealed decreased levels of the GLP-1 hormone. Though the primary cells that synthesize and release this hormone are found in the small intestine, there's also a source in the brain called the nucleus tractus solitarius. "Knowing all of this got us interested in GLP-1," Schmidt says. "Does it actually play a role in modulating cocaine-mediated behaviors?" From there, the research team homed in on GLP-1 receptors and the drugs that activate them, what are known as receptor agonists. To test the efficacy of the medications in question, Schmidt and colleagues used an animal model of relapse with rats. For a three-week period, the rats could press a lever for intravenous infusions of cocaine as frequently as they desired. On average, the animals self-administered 28 infusions of cocaine each day. The scientists then swapped out the cocaine for saline, leading to a period of withdrawal. Lever-pressing rates dropped significantly. "At that point, we considered drug-taking to be extinguished," Schmidt says. "We then reinstated drug-seeking by re-exposing the rats to the drug itself or to cues paired with the drug during the self-administration phase, like a light that comes on when the lever gets pressed." Once again rats depressed the lever at high rates, an indication that they were seeking the drug—akin to relapse in a human who is addicted. The researchers next pretreated the animals with one of the FDA-approved drugs intended for diabetes and obesity treatment, Exendin-4, to determine whether it might reduce or altogether block cocaine-seeking. Results showed a significant decrease in drug-craving and -seeking, both after an acute injection of cocaine and from re-exposure to environmental cues during withdrawal. "This tells us Exendin-4 can block the effects of cocaine itself but also condition stimuli previously paired with cocaine," Schmidt notes. "This was really exciting because it's the first demonstration that the GLP-1 system, and the drugs that target this system, could potentially play an important role in cocaine seeking and relapse. The other really interesting aspect of these studies are the doses." GLP-1 receptor agonists are known to cause nausea and vomiting at pretty high rates in diabetic and obese patients who use them, so Schmidt and colleagues wanted to ensure that the reason for a decrease in cocaine-seeking wasn't from animals being sick. They identified doses that both reduced cocaine-seeking and did not produce adverse effects. A follow-up experiment that infused the GLP-1 agonist directly into the brain replicated the findings. Taken together, these findings indicate that low doses of a GLP-1 receptor agonist can selectively reduce cocaine-seeking without causing nausea. 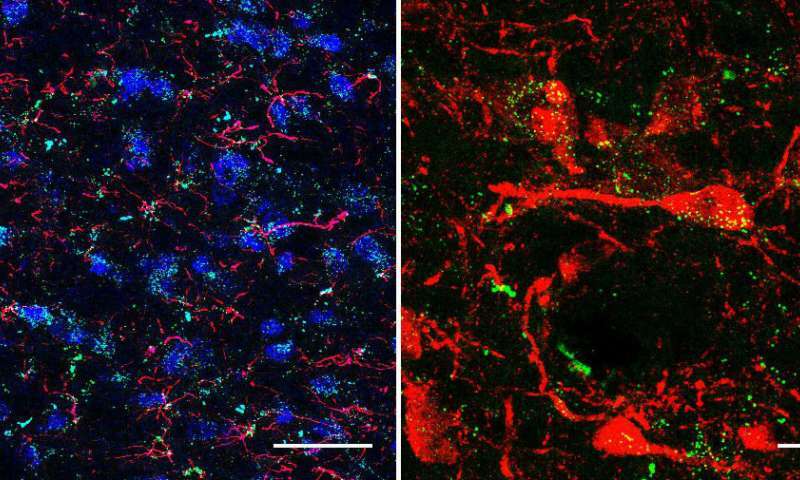 As a final step, the researchers isolated the brain pathway able to boost GLP-1 signaling, by using a fluorescent dye to track where the drugs actually went in the body after they were administered. "We've shown for the first time that central GLP-1 signaling plays an important role in cocaine-seeking," Schmidt explains. "We've identified systematic and intra-cranial doses of GLP-1 receptor agonists that reduce cocaine-seeking and don't produce adverse effects, and we think that if you increase GLP-1 signaling in the brain in general, you can reduce cocaine-seeking in rats and, potentially, craving-induced relapse in humans." To begin testing this, Schmidt's team is collaborating with researchers at Yale University to screen the efficacy of these drugs in a population of humans addicted to cocaine. Beyond that, Schmidt says he's hopeful these results have potential for drugs of abuse beyond cocaine, too. However, he adds, much more research is needed before this can be stated conclusively. "There is a lot we don't know about the GLP-1 system in the brain," he says. "What is the exact circuitry in the brain? Is this signaling the same as what mediates food intake or is it slightly different? Does cocaine change it in any way? We're working on that." Treating cocaine addiction by reducing our appetite for drugs?